my little red suitcase: blue sky and bunting! Oh we do need some summer sun......! 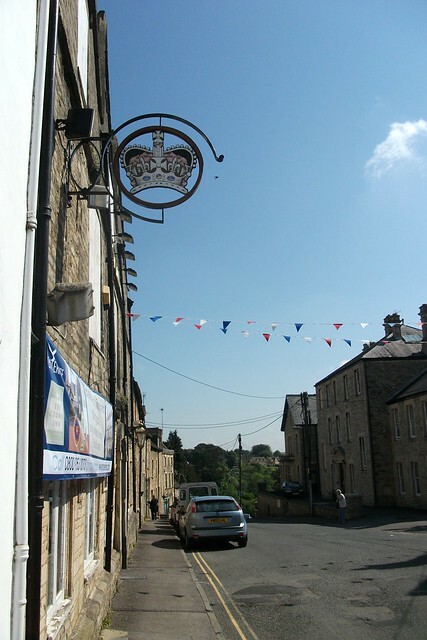 some blue skies and some bunting flapping gently in the breeze. This was a little jaunt I went on last week. I had three hours to spare, while I waited for an appointment. After doing the early morning drop off it seemed silly to drive back and forth again. Not much has changed since I wrote this post here, except less snoozing time on my part. I do love to wander around nice places, just taking in the day. I realize that some of my happiest moments are when I am escaping for a while into another place, either that or when I'm creating. It's nice to give yourself permission to just hang out somewhere and watch the world go by. It's a way re-finding myself for a while, away from everyday. 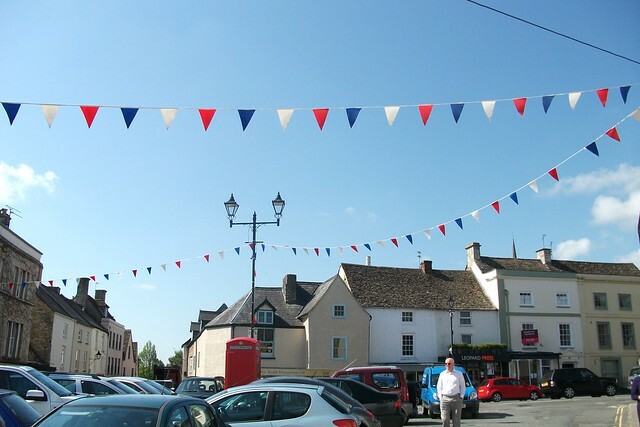 Tetbury is a very traditional English town in the Cotswolds. Originally a center for wool and yarn trading in the middle ages. 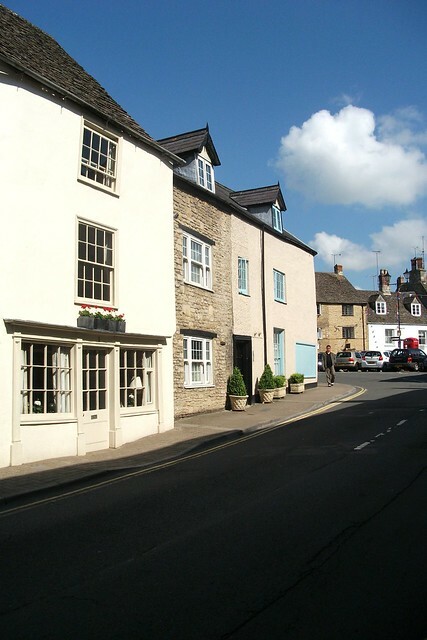 The houses are characterful and built from Cotswold stone, many with original Tudor detail. Across the street there I found my new colour inspiration house there on the corner! Freshly painted sandy colour walls, with a bright aqua blue woodwork. I like it very much. Re-painting a house is quite something though. There it is again on the corner. I think it might have been an old pub looking at the billboard. 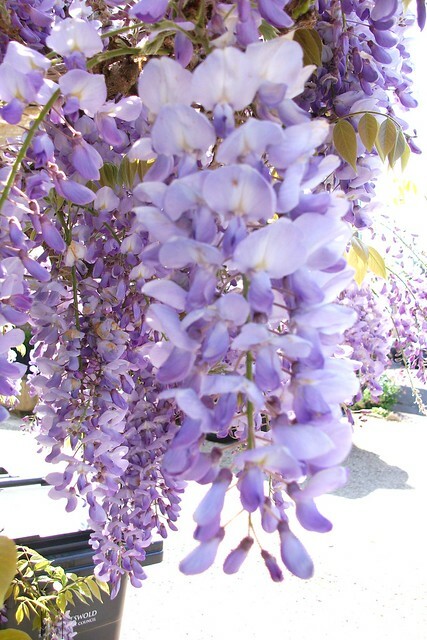 I like to wander around looking at the houses, the tastefully painted woodwork and pretty Wysteria climbing the walls. 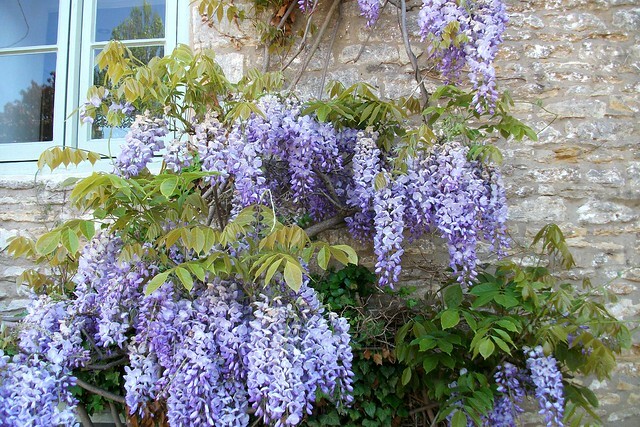 It truly is Wysteria season here in the Cotswolds. It's so very pretty. Looks nice with the painted windows! We are definitely on royal stomping ground here. We call it Prince Charles' polo country! He lives nearby at Highgrove and also has a shop in the high street called Highgrove. 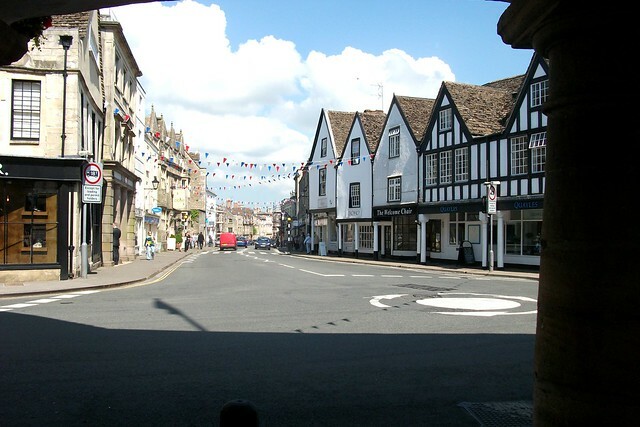 The high street is full of antique shops. Everything is quite expensive here, although I do have a look in several charity shops. Little dog is allowed in everywhere except Highgrove! She is greatly admired by many here, a town full of dog lovers it seems! I love all the bunting, it's seems to be what we do best. Lots of visitors come here. It's daytripable from London. 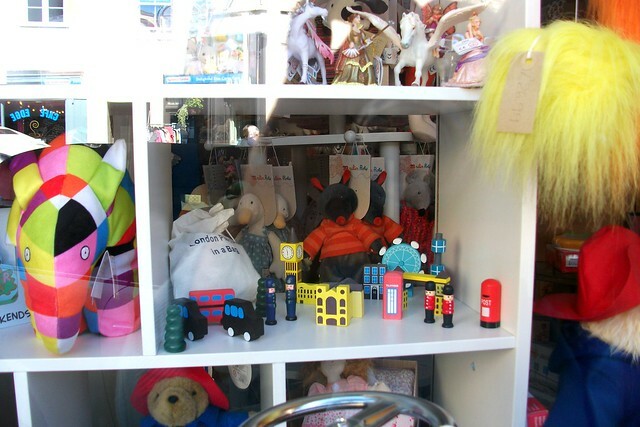 Looking in the toy shop window I spied this London in a bag set, love this. I grew up in the suburbs of London and enjoyed roaming around there. Now I love the countryside here. This has become my sons childhood home, which makes it really important. But if I were to live anywhere else it would probably be the coast. I like the Jurassic coast. Oh and last thing to do before my meeting, refreshments of course! Sometimes I people watch from the cafe sitting outside on the street. Little dog is allowed in, even inside! (dog-lovers!) sitting outside, each chair has it's own sheepskin thrown across and a wool blanket should it be chilly! so you can sit here even in the winter. 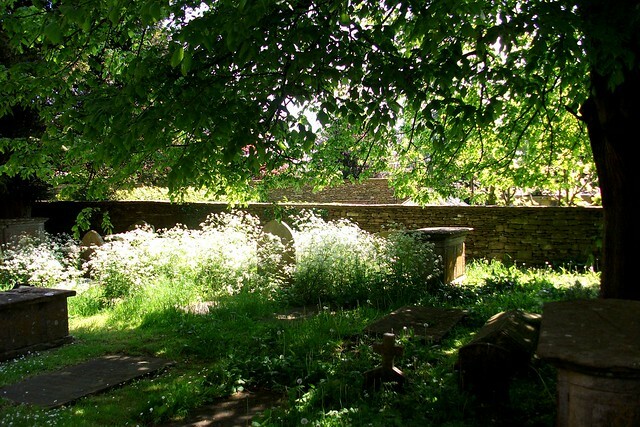 But this day, I have a mini flask and I find a quiet spot in the churchyard amongst the Cowparsley. I have to compose myself. 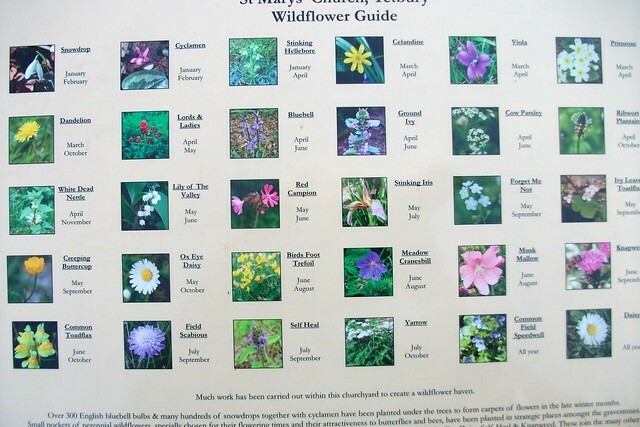 While I was there I've taken a picture of the wild flower guide, so I can learn the names. And then it was off to my meeting. It's nice to escape now and again. I think I'm going to have to get out the bunting and bunitfy something this weekend. Do you like that word?! what a lovely, lazy 3 hours stroll....great!!! I need one right now!!!! What a lovely thing to do Heather, and what delightful pics for us to enjoy - I'd love to visit this beautiful quaint little place. I like the paint work on that house also and the bunting is so cheerful. 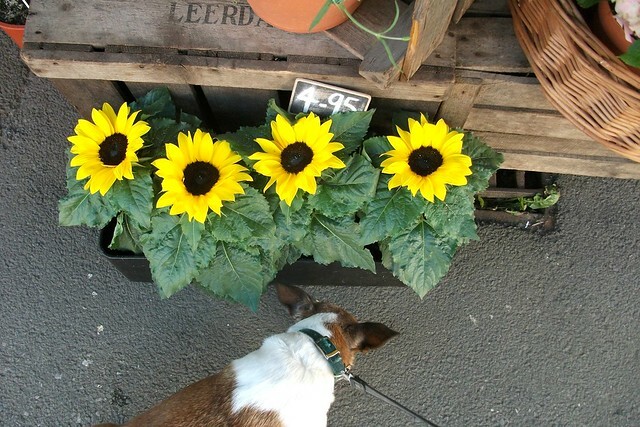 So nice to see your little dog having an outing as well, and being so welcomed in 'most' places. I will take a closer look at the wildflower chart for I am finding that my memory has 'put aside' a lot of the names since I've been over here for so long! Hi Heather,Escaping is such a fun thing to do!! !|When Little Miss J writes exams,it means a day into town for us and then I usually wait at a coffee shop 'till she's done(about 3 hours)!! !I love to people watch and just get lost in my own thoughts!! !Then we have a nice lunch somewhere,just the 2 of us!! !We do a little shopping and then it's the long road home again!! !These little escapes do wonders for me!! !Even though I feel a bit guilty,Little Miss J is not in the same happy place as what I am,exam stress you know,I still love my coffee shop escapes!!! !You live in such a beautiful place!! !It looks like a proud and happy little town!! !Hope you have a happy week!! !And hugs to your little dog!!! Oh yes I do love a bit of bunting!